I like caves and skiing, of course, but it is rare that the two mix. 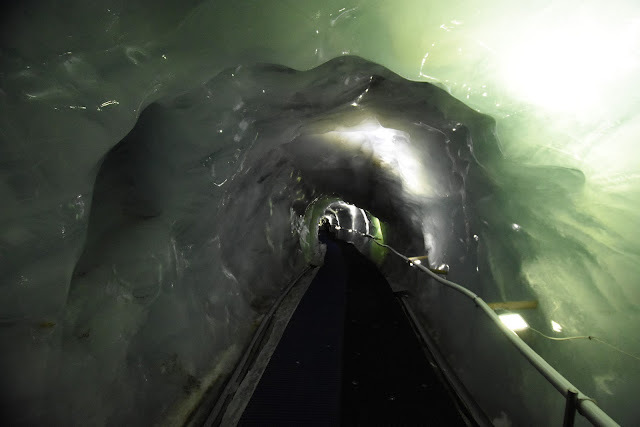 But in Cervinia there's small cave that you can ski through. If you dare. The cave can be found right next to the Rocce Nere 1 ski run, among a set of towering rock columns. 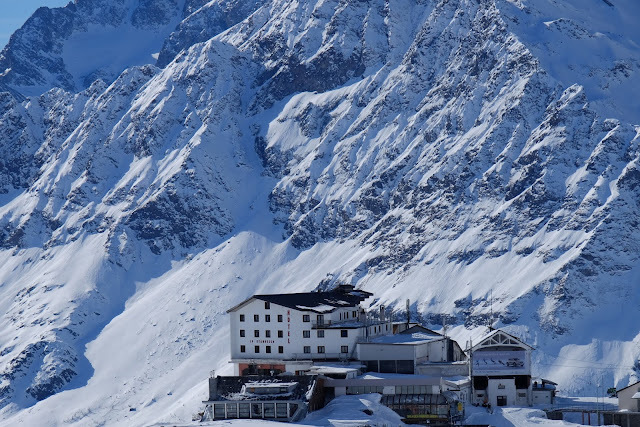 You can get to this run via the Pancheron chair lift, and the exact location of the cave can be found this Google Maps link. The cave is small, something that would be classified as cave only in cave-poor Finland. It is formed from a large rock that has cracked and created a opening 70-90 cm wide, with another big rock forming a roof. What makes this cave interesting is that you can ski through it. 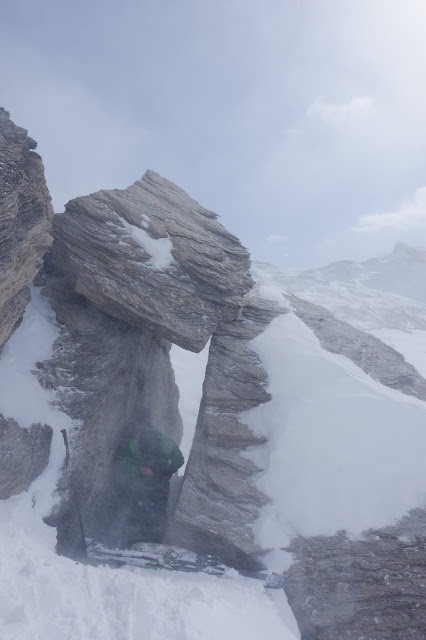 Depending on snow conditions it can be quite easy to enter, but the exit is more demanding. 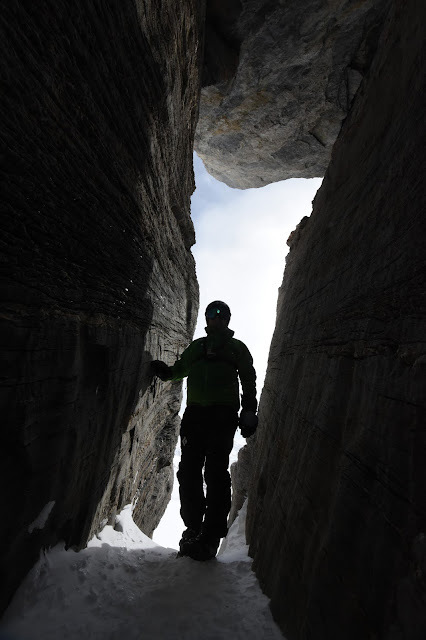 The exit is much lower than the entrance, and while the crack is straight and wide enough to be skied in, you'll begin your exit by dropping an almost vertical slope for about two meters. 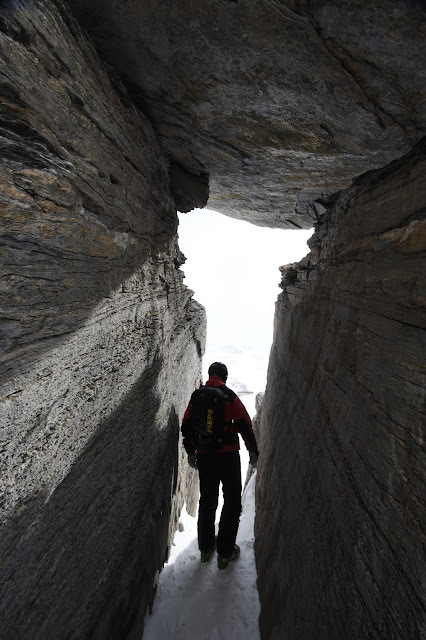 From there on the, the slope curves nicely, but as long as you are within the crack, there is a chance of colliding with the side walls. The left wall, in particular, curves slightly toward you before the final exit. 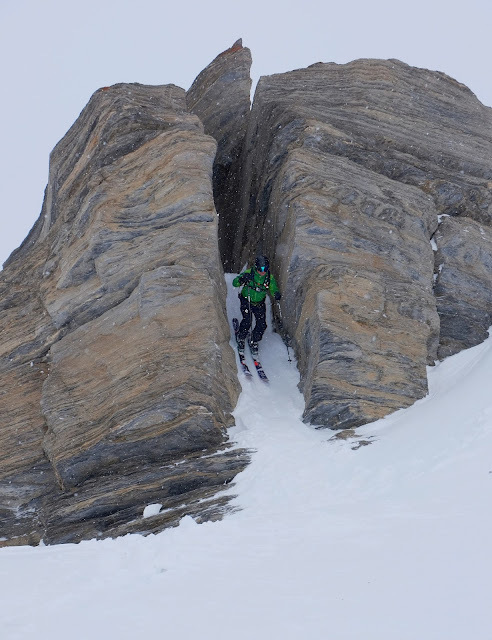 And after exit there are rocks in the ground that need to be well covered by snow before you dare ski over them. 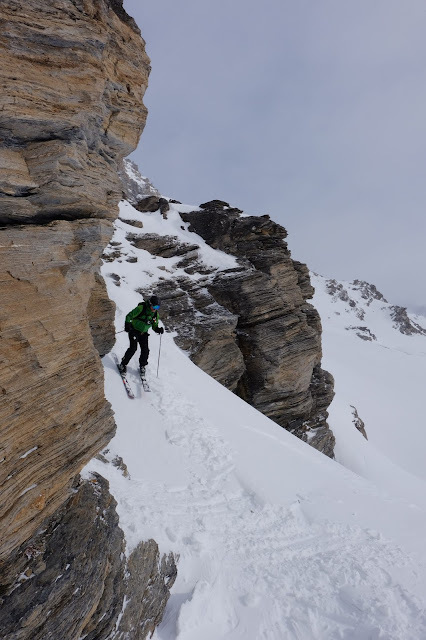 It isn't much of an issue, but I didn't want to hit any of the rocks at high speed, so I spent a long time pondering whether I'd dare ski down. In the end I gave up, and we continued skiing elsewhere with Jarmo. But later I returned, determine to ski through, and did. We also visited the touristy ice cave at the top of the ski station on Klein Matternhorn. 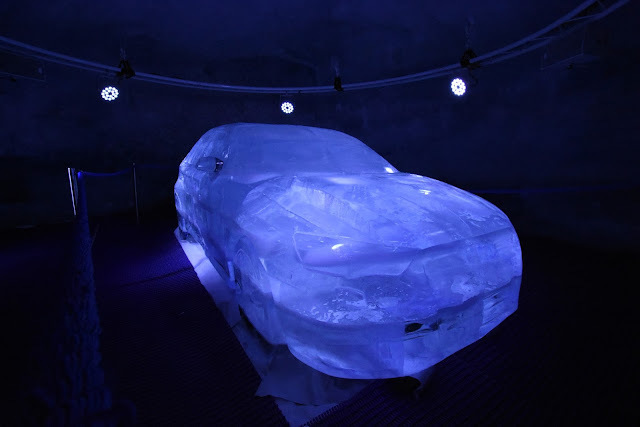 You take a lift couple of floors down, walk through an ice tunnel to enter a bigger area with various halls, sculptures, and even an ice slide. Unfortunately, as we were about to take a slide, the personnel came to close the cave for the day. 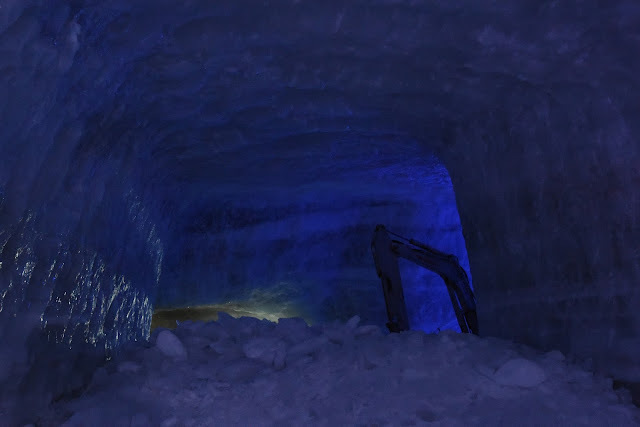 Interestingly, the cave is constantly being formed and re-formed, and there's even a small excavator within an area of the cave that is being built. I'm not sure how they got the excavator in to the cave, how they will get it back out, and how they get fresh air in the cave while it works. We also skied in many places outside the official slopes in Cervinia. 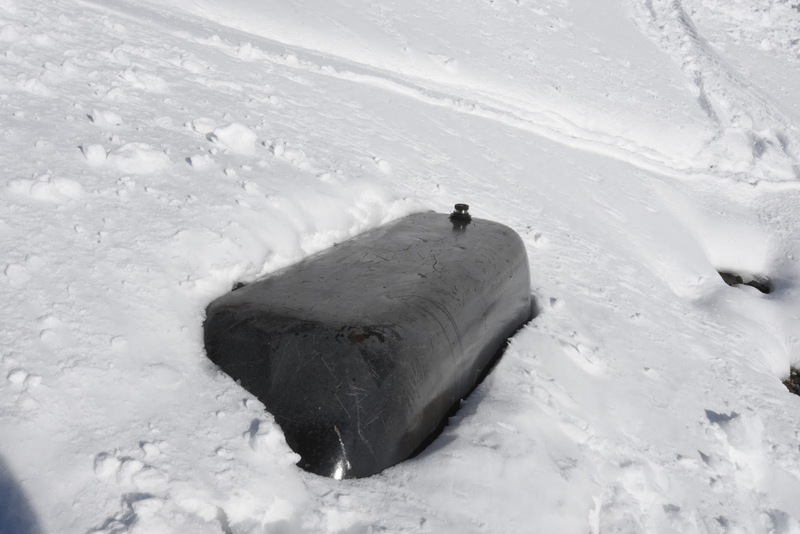 More on that in later blog posts, but be aware of hitting bathtubs while out there! We run into one on our excursions. I wanted to turn it around and sit in it, but I was scared that it might start sliding down, so we left it alone. 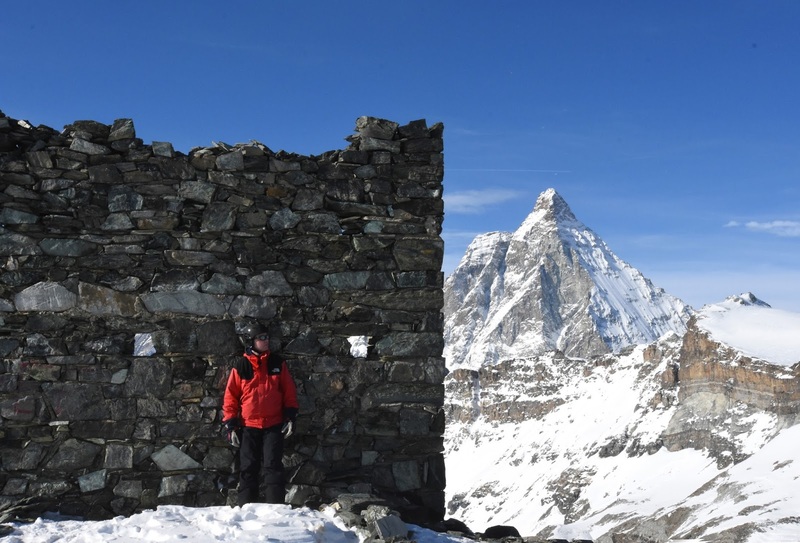 I've been to Cervinia before, but had not stayed in the village. The village is surprisingly small, but big enough to have one food market and many small restaurants. 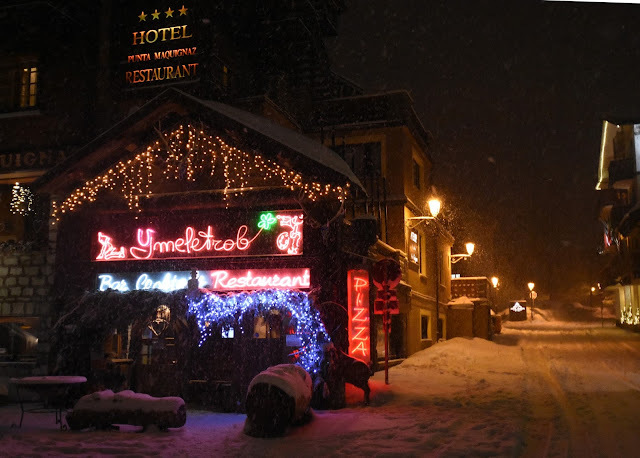 The restaurant that we most liked was "Ymeletrob", a place that mixes a bar to a grill and to a fine-dining establishment. I recommend the salmon hamburger, in particular. Followed by chocolate fondue. Naturally. Photos and videos (c) 2016 by Jari Arkko and Jarmo Ruuth. This blog is also available at the TGR site. Tämä blogi löytyy myös suomeksi.